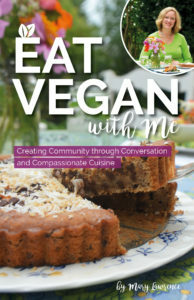 Vegan Publishers is pleased to welcome Ellen Jaffe Jones as our second blog contributor. Ellen is a certified personal trainer, highly accomplished runner and certified running coach, former TV investigator/consumer reporter, and author of “Eat Vegan on $4 a Day.” Her new book, “The Kitchen Divided-Vegan Recipes for the Semi-Vegan Household,” is due out this summer. If anyone should be terrified of breast cancer, it should be me. My aunt died of it in our home when I was five. As I say in the video below, figuring out the truth about food and how to avoid breast cancer has become the investigative reporting job of my life. Many newspaper articles have been written about my apparent success in defying the odds. When I worked in TV, I met a doctor who suggested my family “donate” our blood and genes to become part of the original BRCA1 and BRCA2 breast cancer gene studies done by Myriad Genetics. My sister was undergoing surgery at the time (one of the rare times you can get blood from a breast cancer survivor…how many consider that when undergoing voluntary mastectomies?) and I drove her blood sample in a refrigerated container to the airport where it was flown to Myriad’s labs in Nevada. Our family really felt like we were contributing something valuable to the world. Studies don’t disclose if you test positive or not for breast cancer genes, but no one in our family needed a study to tell us what we already knew. I’ve had doctors offer to get me tested privately, since testing positive before I go on Medicaire in four years is considered a pre-existing condition. My doctors all told me, “Other than getting prophylactic mastectomies to remove your breasts, there’s not much else you can do. You’ve already changed to a vegan and running lifestyle.” A footnote: Breast removal still leaves about 5% of breast tissue attached to the body. So breast removal doesn’t reduce the breast cancer risk to zero. Both of my sisters are significantly older than me, which gave me plenty of time to see what worked and didn’t work. They led public lives, so much of the information I relate here is already “out there.” One of my sisters has had breast cancer three times even though she breastfed her four children about six months each. Breastfeeding has been shown to be preventative against cancer in the mother and female offspring. With my sister, that still wasn’t enough to defy the genes. My other sister had diabetes and heart disease for decades. She went in for “routine” surgery and got MRSA…antibiotic resistant staph infection. She is now paralyzed and in a nursing home for the rest of her life. Within a year of that, she got breast cancer. The day she got MRSA was the same day my dad died in the intensive care unit. They had beds next to each other. We used to joke in our family that family reunions took place at hospitals. The year my first sister got breast cancer was the same year I almost died of a colon blockage. Docs in the emergency room said they’d never seen a blockage so large in someone my age and I would need to be on meds for the rest of my life. That’s when I ran to the health food store and read all of the available books on fiber and changed my eating habits big time. I began running too, and I believe it has made a huge difference. I had breastfed all of my children. I became the Missouri Associate Coordinator of Leader Applicants for La Leche League International, a great breastfeeding and information volunteer support group. Doctors again were telling me, “You better do something different with your life or you’ll end up like everyone else in your family!” So I started with a macrobiotic diet (basically vegan with fish), then went vegetarian, then vegan. When I worked as a financial consultant, we were often in an office all day with working lunches where the only choice I had was the topping on the pizza. I kept my McDougall vegan soup cups in my desk and picked my battles carefully. I gained 25 pounds and a lot of cholesterol. 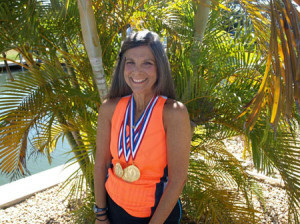 When I quit this job and joined my husband in his media consulting business, I was able to take control of my diet and return to running. The weight melted off in six months. I saved myself from a hysterectomy by returning to a vegan diet because I had an OB who courageously said, “Go back to that vegan diet and call me in the morning.” Within three weeks of returning to veganism, all signs of menopause were gone. Since posting the aforementioned Youtube video, it’s had more hits than any other videos I’ve done, including the ones with my dog. I think this video really struck a cord with other women who may have to face similar decisions, or who understand how powerful a plant-based diet can be. In my teaching classes for Physicians Committee for Responsible Medicine, The Cancer Project, we discussed with students the research that says one-third to two-thirds of all cancer is diet-related. I’ve received some comments that Angelina Jolie should be free to make her own decision. Let me stress that I don’t pretend to second-guess her. However, it is ALL about making informed choices for the rest of us who must pick up the pieces after her ringing endorsement of this expensive, painful and perhaps unnecessary decision. Most docs don’t get a single nutrition class in medical school. How many hysterectomies and breast removals could be avoided if more doctors advocated for a plant-based diet? How many voices like mine are out there saying, “Wait…changing your diet could be so much easier and cheaper and even enjoyable!” It’s about informed choices. Please get all of the facts, options and multiple opinions before digesting mastectomies as routine and easy as swallowing a magic bullet pill. I’ve seen many mastectomies end up with horrific complications or side effects the patient had no clue could happen. Changing a diet is much easier.